Home > Cityscapes, Lifestyles	> Switching gears. If you have been following this Blog, you can tell that nature is at the heart of my imagery. As much as I yearn for the spiritual embrace of the wilderness, in order to show my work it is necessary to make the occasional expedition into the concrete jungle. Don’t get me wrong, we have some great cities in this country, New York, Chicago, Boston, San Francisco (etc.) to name just a few. But for me, when the waves are crashing against the rocks, or the mist is moving across a lake, that is where I am at peace. Nevertheless, even while visiting the city, I do not feel complete without a camera in my hand. I inevitably photograph the cities I visit, always looking for a natural element to contrast to the manufactured. As a result, I created my Series entitled: Cityscapes. For this series I sought to photograph iconic locations in New York City, as they were touched by Mother Nature. 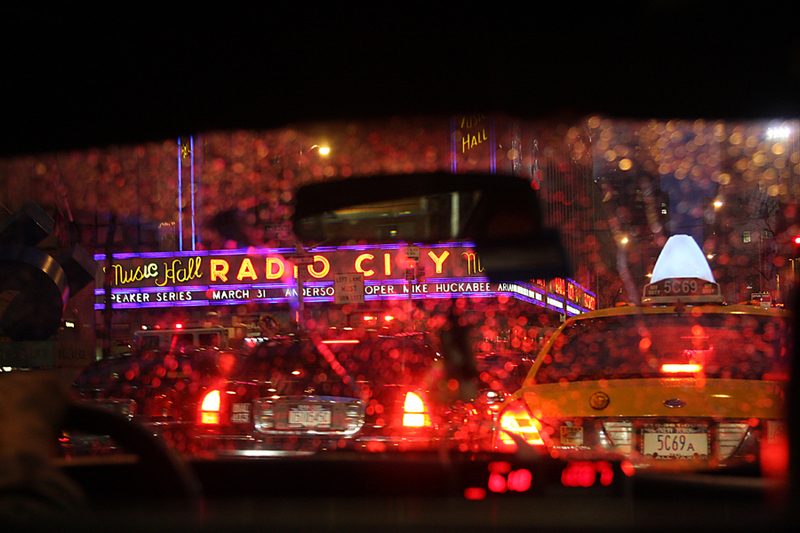 In this particular image, my vision was Radio City Music Hall seen through a Taxi Cab window in the rain. In the resulting capture, the lights of the running taxi meter remind me of how many times I instructed the driver to circle around the block until I got what I was looking for. Lucky for me, New York City cab drivers don’t turn on their windshield wipers unless there is a Monsoon. In 2010, a black & white rendition of this image was chosen for Gallery Exhibition by Joyce Tenneson (www.joycetenneson.com), who is considered one of the most prolific photographers of our time. Her well known generosity of spirit and ability to capture the soul of her subjects, has long served as an inspiration to me. Reversal of Misfortune. Through the Roof.